2012 – The year I felt parenthood truly begun! This is the year my first born entered primary school. I reached a paradigm shift in how I bring up a child. My time is no longer mine to plan. It is no longer “Let’s Go!” Now it’s “What did Mrs Tan say?” You see, Mrs Tan is Nicole’s P1 form teacher. She represents the school. So other than making my plans fit the School Calendar, I have to consider the Class Calendar (English Spelling every Tuesday, Chinese Spelling every Thursday, and some schools have Math Spelling too!) Every other night is now either going through English Spelling or Chinese Spelling. There is no letting up. The only break I got, we got was the school holidays! I learnt how important it was to give her a time table after school. And I’ve memorised it too! So that I know what to ask when I call home, I know what to expect when I get home. Lesson Learnt: The time table was too generic. I’ve to add a little more details! One big lesson Nicole learnt was to Honour God is everything she does. It started off with her allowances. We give her $1.20 daily. (I tried $1 and it wasn’t enough!) From Day 1, she will set aside 10 cents to God as her tithe, and bring $1.10 to school. When she’s back home, the savings would be kept be put aside. This culminates till the end of the week, and on Sunday, she’ll have her offering to drop in church, and savings to put in the piggy bank. And since she started school, God became more real to her. Her prayers are said with much more sincerity especially since she really needs help with those tests and spellings! Seriously, when she’s in P1, she’s very much on her own. We are now only accessible after school or when she can lay hands on a phone to call us. She learnt consequences (when you forget to bring a Math book), she learnt handling friendships (when Jane doesn’t want to be a friend any longer & Mary stopped talking to her on that same day), and she learnt that she’s not the centre of the universe in that huge primary school she’s in. So reliance on God became a big thing! She’s alone. It’s just she and God. Looking back now, Nicole grew up quite a bit this year. (She shrunk in size though… skinnier for some strange reason) I grew quite a bit as a parent too. I realised everything I taught Nicole prior 2012 was a platform for her in P1. And everything that I do now when she’s in primary school becomes building blocks to her habits/values/perspective towards school, and shape her ‘worldview’. I’m beginning to see now. 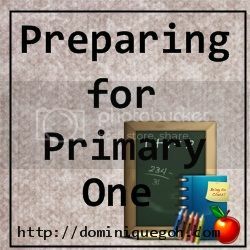 It really starts at Primary One. Jiahui is a brand new mummy of 3, who is learning something new every other day as she works full time. With each experience with her kids, it was clear that she can’t keep mum about the parenting journey. She started the blog Mum’s the Word as living proof that life is different for each child. Wah I took one look at the time table and shivered! Not looking forward at all leh!! Omg. cool! at least at a young age, she already knows how to save.